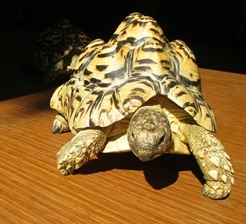 An average adult leopard tortoise is 18 inches in length and weighs approximately 40 pounds. These tortoises are yellowish-cream in color with high dome-shaped carapace. The carapace has black markings that make the tortoise look very attractive. Leopard tortoises are herbivorous. When threatened these animals retract pulling their heads and legs under their shell. Sexual maturity is reached at 12 to 15 years of age. However, sexual maturity is dependent on growth rate. In captivity tortoises grow faster and reach sexual maturity when they are younger (example 6 years). Females lay 5 to 20 eggs in each clutch.